I'm not complaining, but I seem to have cobs of corn coming out the wazoo. I actually look forward to my wazoo overflowing about this time every year. I've been a corn on the cob fiend ever since I was able to pick it up with my own two hands. I can still remember how distraught I was when I was able to eat it because my teeth were either too loose or missing altogether. My youngest is experiencing that right now. I do think it's kind of fun to break out the knife and shear sheets of corn from the cob, though. But it's so much more fun to go typewriter on a few good cobs. While the whole family prefers it over an open fire or on the grill, there are times when we cook it inside, as well. Preferably under the broiler (just something about that smoky, charred taste), but occasionally steamed or simmered. The other day, with a dozen and a half ears waiting to be eaten, my neighbor handed a huge brown bag over the fence...and it was filled to the rim with more corn. She said she couldn't look at another cob for awhile. I will happily be on the receiving end of that! So, we've been not only eating it from the cob, but slicing it off to make creamed corn and casseroles and soup! While I had high hopes for this bowl of chowder, it wound up being just okay. We liked it. We ate it. But it probably won't be something we make again. But if I do, I'll use at least double the shrimp and the corn. It wasn't the pretty yellow I imagined it would be either. Oh well. It wasn't our favorite meal of all time, but it was pretty good...totally edible. Peel, clean and tail your shrimp and cut the corn from the cobs. 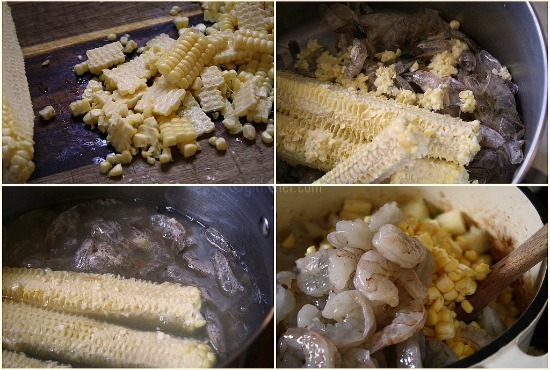 Place the shrimp shells and tails, and the cobs (milked with the back of a knife) into a pot with the chicken broth. Bring it to a boil, reduce heat and let simmer ~15 minutes. Strain out the solids and return to heat to keep warm. Heat a large Dutch oven (or other heavy soup pot) over medium heat and add your bacon. Cook until done, and lift out with a slotted spoon to drain on a paper towel-lined plate. Set aside. Pour off all but about a tablespoon of the bacon grease, then return pot to the heat. Add onion, potatoes, jalapeño, and thyme to pot and cook, stirring, until onion is softened, 3-5 minutes. Add corn and about a quart of the hot broth. Bring to a boil, and simmer for 10-15 minutes, or until potatoes are tender. Add shrimp and cook another five minutes. Stir in the cream and season to taste with salt and pepper. If you wish, pulse with an immersion blender a few times. To serve, ladle into serving bowls and sprinkle each with the reserved bacon, some oyster crackers, and some fresh parsley, cilantro, or other green herb of your choice. It's Soup, Salad, and Sammie week at IHCC! I totally love to go typewriter on some corn...haha! It looks like a thick and fulfilling bowl of chowder, but I hear you. As much as I hate to say it, sometimes Jamie falls flat in the flavor department (but I still love him dearly). Do you ever make corn cob stock? Ever since I made Symon's recipe I've been hooked. I love that stuff! It's so pretty. Too bad you didn't like it. The corn this year has tasted very sweet to me. Cannot get enough of the corn right now. While you were cooking up that delicious soup (love the shrimp in it), I was make grilled corn chowder soup - and it was perfect. The jalapeno in your soup must add a little flavor. Chowder is so time-consuming - a lot of dicing - that it is a disappointment when it doesn't sing to your satisfaction. 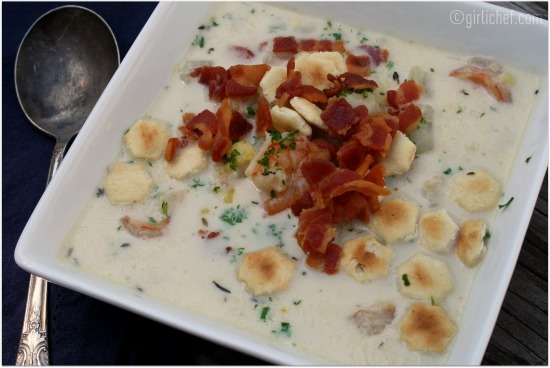 I love chowder ad I love bacon, so this is MY cup of tea for sure! This looks amazing! I love your chicken corn chowder so I know I would love it with shrimp....yum! I think I'd forgive Jamie for pretty much anything- and even if it didn't blow you away- your photos are enough to make me want to give it a whirl. Your blog is absolutely beautiful. Sorry this wasn't as awesome as it sounds and looks. Actually have this on my "to try" list. Oh well. Better luck with the rest of your corn! Que rico se ve esto, no lo conocía. 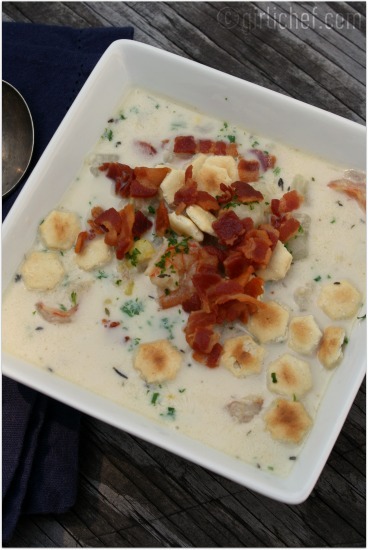 Your Chowder looks lovely, sorry that it wasn't all that you had hoped for. This time of year I make my Caribbean Clam Chowder with Corn using fresh corn and it makes it so sweet and delicious. Thinking about it, I may need to pull some from my freezer stash for lunch tomorrow. I'll also need to look up that Corn Cob stock recipe as I've never tried that. Very rich combination absolutely delicious, I love this dish, hugs. Hey, This is looking so Gud and Appetizing… ! A very well made post with beautiful pictures.Loved it. Have a wonderful week ahead. Thanks & Regards, Sonia !!! Sweet summer corn is one of the most delicious things to munch on, either straight up or mixed into delicious soups and chowders like this! Double the corn and shrimp sounds like the way to go. ;-) Sorry it wasn't a "wow" but thanks for sharing it with Souper Sundays. I agree that corn chowders should always be overflowing with corn! I think yours looks yummy, but I'd add extra corn too. Send some my way - especially this chowder! I hate it when I think recipes are going to be wonderful and it just ends up so-so. I love shrimp and corn chowder and it's a Jamie recipe, so you'd think it'd be wonderful. I too would have thought it'd be more yellow in color. I'd take this as a challenge to create an even better soup! Hummm, I have shrimp in the freezer and there is corn to be bought at the farmers market ... I may have to experiment. 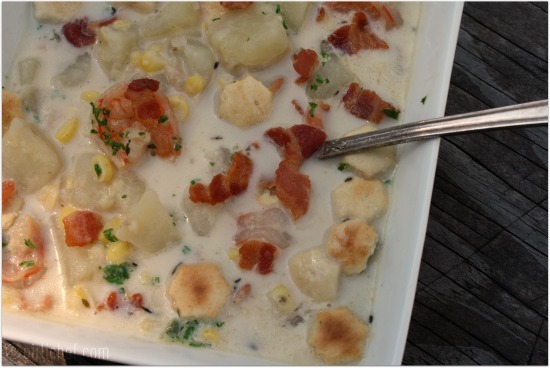 What a perfect chowder; I discovered only this summer how much adding frsh corn makes your soup or choder so much better; your recipe is a keeper; thank you. A scrumptious looking chowder! What a great combination of ingredients. I hate that it turned out jsut okay. I do though appreciate using the tails and cobs in,way to go on flavor. ps. My younger sister loves corn on the cob.She had a nickname when she was little- corn machine.We still call her it to this day. Bless her heart. I love corn on the cob too - we have had some Niagara corn and it is beautiful. Delicious looking chowdah - I'm with you though, double up on the good stuff! The bacon on top is just the right ingredient for a memorable dish.